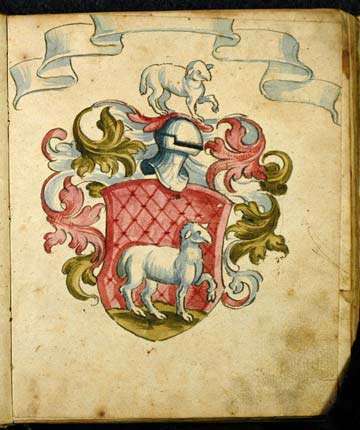 The Book of Lambspring is one of my favorite alchemist manuscripts, because of it being simple and direct without to much arcane chemical language, although still symbolic. 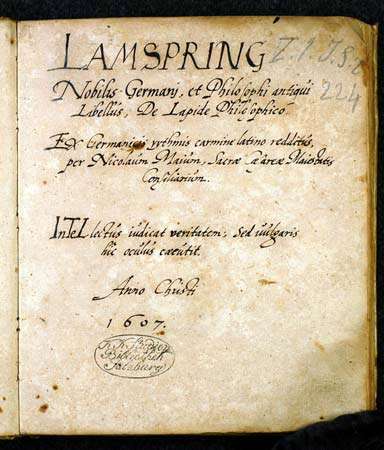 The Book of Lambspring is one of the few real-life cases of a centuries-old book on alchemy. 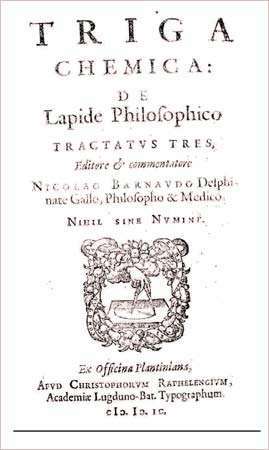 Originally published in Latin by Frenchman Nicholas Barnaud under the title De Lapide Philosophico Triga Chemicum in Prague, 1599, it does not appear to be an original work, but rather an edited collection of manuscripts that had been passed around for at least twenty years previous. 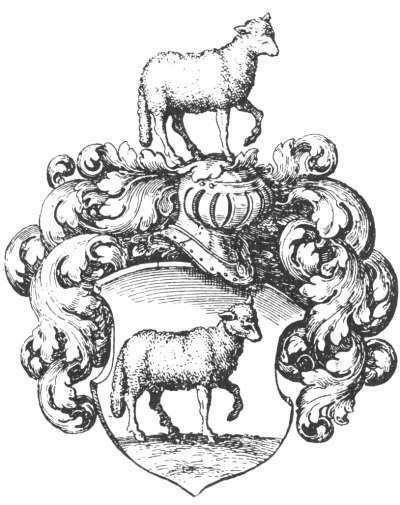 Later, Lucas Jennis published the work in full in Frankfurt, 1625. Though the Christian Church burned most of the copies over the centuries, there are still a few copies of the original remaining intact. 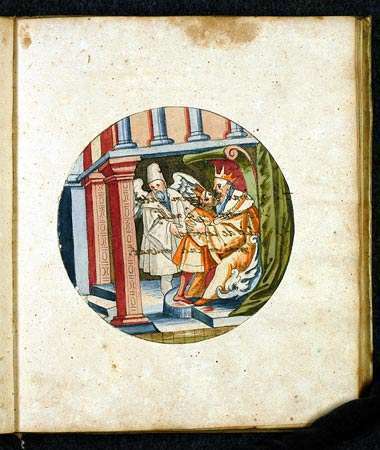 One of them (Ms 16752) is in the National Museum of Nurenberg, and another is in the University of Leiden. 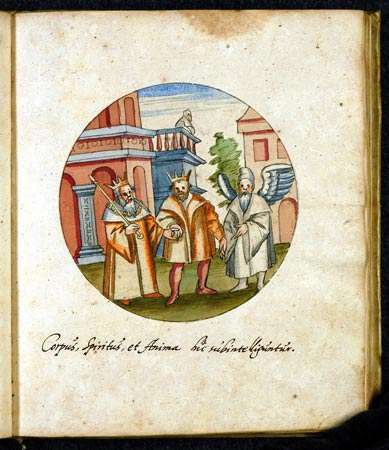 In the left column is the Barnaud version; in the right column are the equivalent images taken from a Latin/German version of 1607; plus my interpretation of the text. 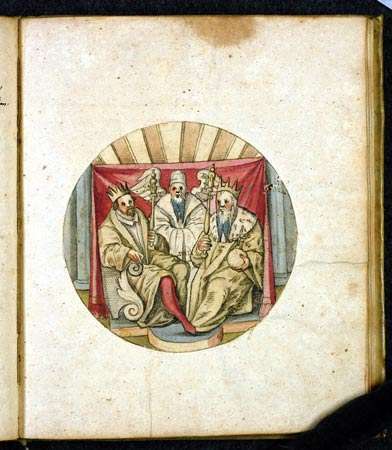 This interpretation is only a guide in how to read and understand the text. The term philosopher in past centuries meant a person who studied Nature, science, mythology, and above all man. 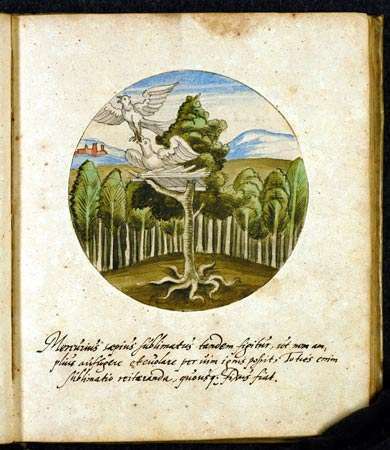 Art was a term used for the alchemical art, or the Great Work. 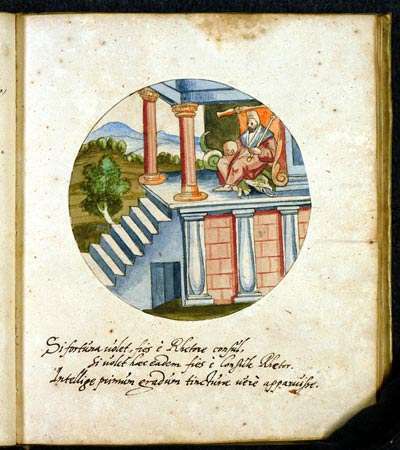 "Study it again and again": a mere intellectual interpretation is not sufficient, one must gain understanding by contemplating the text and images. 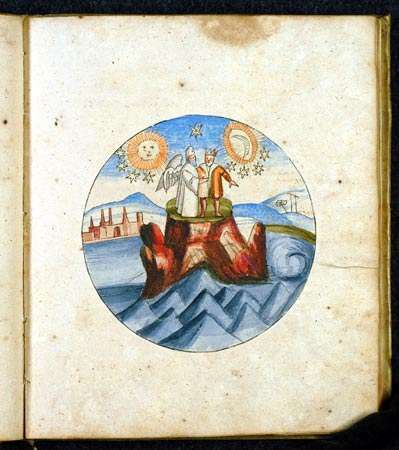 The emphasis on directing one's attention to God, or Jesus Christ can be found in several alchemical manuscripts. It is an important part of the Great Work, because after all it about discovering our divine essence. That is the object of the direction of our awareness. 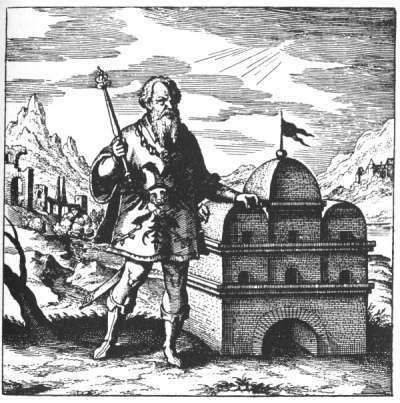 "For there is only one substance": in spite of the multitude of symbols, like mercury, salt and sulfur, the alchemists keep on repeating that there is only substance to work on, and that is the alchemist himself. The alchemical process is very simple: it is the purification of oneself, nothing else. Of course, 'normal' people don't understand this. The body is compared with a sea/water, because when one direct one's attention inwards, like in meditation, the inner awareness is alike a vast sea with no boundaries. It is the soul and spirit that needs to be purified. Although we make a distinction between body, soul and spirit, there is only one you, although one can look at oneself in these three apparent different aspects. Putrefaction is the stage of blackness, the blackness one encounters when the eyes are closed. The dragon is a symbol for the untamed energies in oneself, especially the thoughts. When one has cleaned up all the chaos in one's mind, and purified one's awareness, then eventually a clarity arises that can be compared with a shining light, or whiteness as the alchemists called it. An actual spiritual light can also be perceived. This is the stage of Albedo. 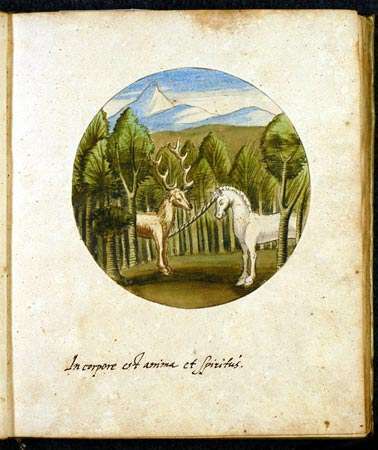 A deer is a symbol for thought because it is swift and runs around like thoughts. The unicorn is a symbol of one pointedness of mind. The fixation on clear pure awareness of self. The unicorn is the Spirit because the Spirit is the center of our being, and on this we hold our one pointed awareness. The deer, or thoughts, is part of the soul. Here you behold a great marvel --- two lions are joined into one. Lurk in a dark and rugged valley. 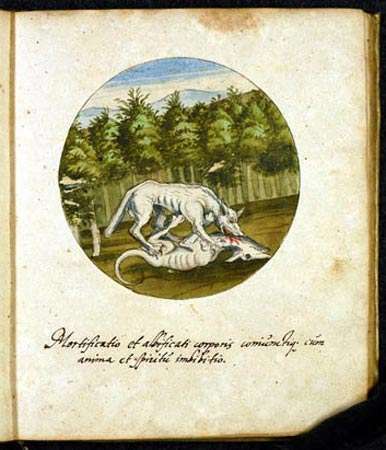 And of terrible and savage aspect. And that his wisdom transcends that of the worldly wise. Usually the lion is taken for the male, active principle in the Great Work, but here we have two lions as symbols for both Spirit and Soul. 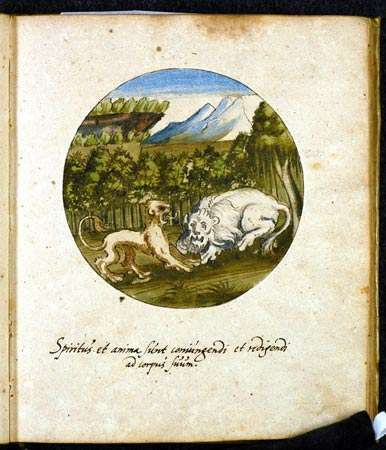 in this sense, we could take the lion as symbol for the emotions (from the soul) and feelings (from the Spirit). Emotions and feelings can indeed be very strong and savage, but they need to be tamed and guided. Who render thanks to God, and do praise Him. Once one has become aware of the inner energies of Soul and Spirit and purified them, then the awareness of these inner energies has to be brought into the bodily awareness, into our every day consciousness. 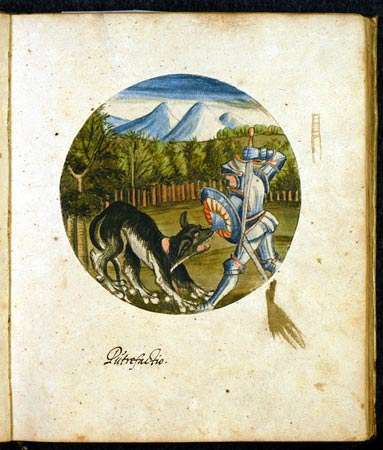 The "wolf from the east" is the symbol for the Fixed, and the "dog from the west" is the symbol for the Volatile. The Fixed and the Volatile are two aspects of the continuous process of distillation and purification. By this one has to understand the alternate direction of attention to the inner, more subtle energies (volatile) and awareness, and the outer, physical, bodily awareness (fixed). This surely is a great miracle and without any deception - that in a venomous dragon there should be the great medicine. Hereat all the Sages do loudly rejoice. Meditation is like dissolving your ordinary awareness (earth) into a larger more subtle inner awareness (water), which we then try to bring back into our body, what is expressed by the term 'coagulation'. 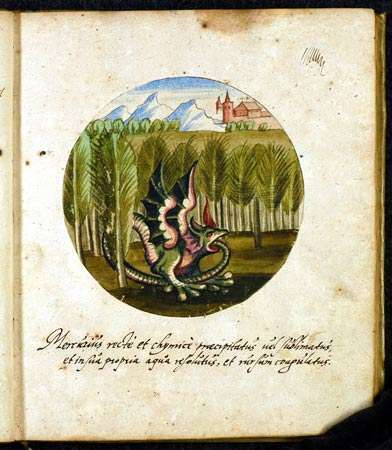 The venomous dragon, usually depicted as Ouroboros, the dragon biting his own tail, is a symbol of the matter, or the Stone, or mercury, that is the inner energies of the mind, when they are circulating in the vase, that is, during the entire process of meditation, or any other spiritual practice. originally it is poison because the mind is originally full of impurities, but by continuous work or practice, they get refined and purified, and thus they become medicine, and will heal both body and soul. Yet neither can get away from the other. Bound together in closest bonds of wedlock. And we render thanks to God the Father. Even when the mind has been purified, one must continue the process, because one has to arrive at a state where this purified, clear awareness remains constant. 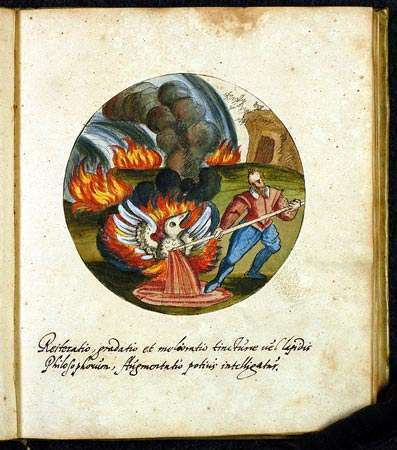 This is the ultimate fixation as the alchemists expressed it, when the Matter, the Stone, Mercury is totally resistant to fire, that it, it cannot be altered anymore by any outside influence. One is completely stable in clear awareness. The two birds that cannot get away from each other are both the physical awareness and the inner awareness that are now joined and form a unity. Here are two birds, great and strong - the body and spirit; one devours the other. In which two birds are bound together. One is of a snowy white; the other is red. And devoured by the other. And has regained a more glorious life. That it might live eternally, and never die. As also the true Philosophers do plainly inform us. Here is another example of continuing the process of purification which brings body and spirit together. The white color is the state of Whiteness or Albedo, the first attainment of clear awareness. The red color the next state of Redness or Rubedo, when this clear awareness is 'fixed, that is, the alchemist is able to maintain it. 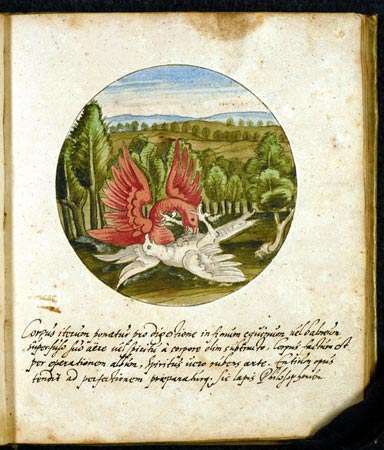 The dove is a symbol of the State of Albedo, the phoenix of Rubedo. When the state of Rubedo has been attained, and clear awareness is being maintained, then one has manifested one's divine self, from which all wealth, health and miracles come from. I am a great and glorious King in the earth. 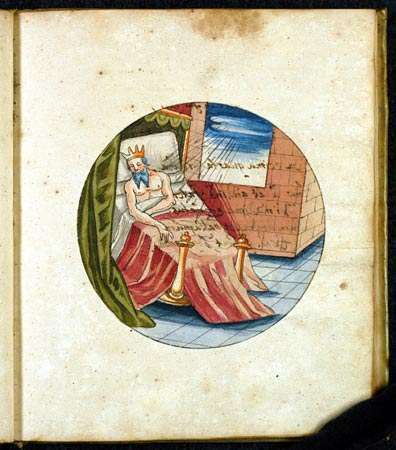 And the panacea for great and small diseases. Till I was set in a high place. Was given me by God and Nature. Therefore Hermes has called me the Lord of the Forests. From here on are instructions for adepts, that is, those who have successfully completed the Great Work, and attained a fixed clear awareness of Self at all times. Very few people will ever arrive at this stage. However, it is not all that can be attained. At this state one is truly a King, master of himself, inside and outside. The purified mind vivified with the divine spirit, is the source of health and wealth. This is the reiteration, gradation, and amelioration of the Tincture, or Philosopher's Stone; and the whole is called its Augmentation. Augmentation is also called Multiplication. The alchemist basically repeats the process but this time with the purified Matter, Mercury, Stone, in order to augment in quality or quantity. The Fire is the Spirit itself, the divine essence in every man. The salamander here is the symbol of that divine essence in its fiery, active, living quality. So, the salamander, the Spirit, is cleansed even more, this time with fire, which is active concentration. This brings about another transformation after which one is truly immortal, in the sense that death cannot become to the body, because the body itself has been transmuted. A Son whom he loves with all his heart. With sorrow he prescribes sorrow to him. Who is to conduct him whithersoever he will. And then derive true pleasure. To the gates of highest heaven. That was beyond measure glorious. And said: I will return to his breast. The father is the body, which of course like the soul, the son, that inhabits it. The guide is the divine spirit, or divine essence, in the person, that now can take the soul to any place in the universe. The divine spirit can now shift its awareness away from the body, and roam the universe from the physical level to the astral words, to the mental realms, and to the spiritual. But eventually one longs to be back into the physical body again. Another mountain of India lies in the vessel, which the spirit and the soul - that is, the son and the guide - have climbed. For he cannot live without me. He sighs and calls aloud for me. That he may rejoice again and live. This strength will we give unto him. And returned to the Father's house. The spirit and soul have left the body and are in the more subtle realms. The body cannot live without the vivifying Soul and Spirit. And lived in great danger of my life. And it fills my breast with joy. And that with his own mouth. The great exertion makes the Father sweat. The soul which has been purified greatly and vivified with the divine essence, enters the body again, but this enhanced energy has a great impact on the body. And to restore him to his former life. And bids the Father lie down and sleep. To the earth from the shining stars. Which bedewed and softened the Father's Body. That we may obtain Thy gracious Gift! The body itself undergoes changes. 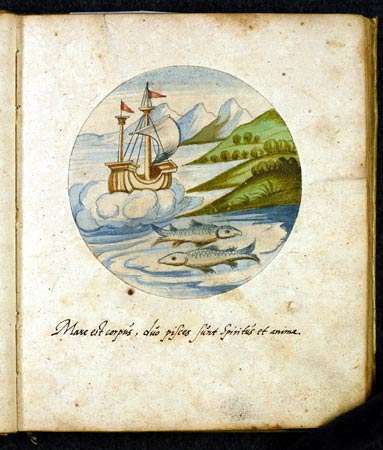 The rain from heaven refers to the Golden Rain from Greek mythology (Jupiter and Danae; and the birth of Minerva from Jupiter's head); although here it is called a silver rain. It is the experience of the influx of divine energies that transform the physical body. And he brings forth a new Son. And the Father in the Son. They produce untold, precious fruit. In the splendour of their new Kingdom. He is arrayed in a crimson robe. This is the unification of the body and the spirit, which by a transfiguration become one and the same, and transcend the laws of Nature.